SHRI KSHETRA SRIKALAHASTI The Temples associated with the Panchalingas SHRI KSHETRA SRIKALAHASTI The Temples associated with the Panchalingas - Shiva Maha Purana, Vishnu Purana, garuda purana, bhavishya purana, skanda purana. Arcot, Chenglepet and Nellore districts were referred to as Thondamandalam in olden days. Kanchipuram was the capital of Thondamandalam. The palavers ruled this place between third century and ninth century A.D. Inscriptions and other archaeological evidence indicate that this place was also ruled by the Cholas, and the Vijayanagara kings. Kanchipuram was regarded as a Temple City and its sanctity is well known. It has been called Sivapuranam, Vishnupuram, Brahmapuram, Thundaripuram, and Kailasam on the earth etc. Swami Madhava Sivajnana wrote Kanchi puranam in view of the rich religious background associated with the Temple City. The famous Sri Kanchi Kamakoti mutt, headed by Jagadguru Sri Sankaracharya, located in Kanchipuram. The city is unique in having the Kailasanatha temple, Vaikunta perumal temple, among numerous other temples. Despite the presence of several temples, the thevaram mentions only five temples: Thruvekambam, Thirumetrazhi, Onakantonthazhi, Kachnerikkarikkaadu, and Anekathangavatam. The temple of Sri Ekambaranatha, known as the big temple, is none other than Kachi Thiruvekambam. Great Saints like Manikkavachagar, Arunagirinathar, and Pattinathaar praised this temple. The Temple City finds mention in the works such as Manimekalai, Dakkayaagapparani, Mathavilaasa praharsana, and Dandialankaaram. Thiruvekambar, Ekambaranatha, and Ekambareshwara are the names of the deity. The goddess is Elavaarkuzhali. The mango tree is considered as the sacred tree associated with this temple. The sacred pond is Sivaganga. Sri Ekambaraswami represents Prithvi linga. According to a legend, Umadevi was worshipping a linga, made of sand, on the banks of river Kampaa. The Lord caused a flood in the river. In fear and anxiety, Umadevi embraced the linga and prevented the linga from being washed away. As the Lord in the form of the linga was under the mango tree, the name Ekamranatha came into existence. It is said that this name was modified to Ekambaranatha in course of time. Although the goddess is known as Elavaarkuzhali, the popular name is Sri Kamakshi. The temple gopuram is nine storeyed and is very imposing. At the main entrance, we can see the images of Vinayaka and Shanmukha. It was built in 1509 by the great Vijayanagara king Sri Krishnadevaraya. Once inside, we come across Vahana mandapam. It is also known as Sharabhesha mandapam. Nandanodyanam is to the left. Followed by the river Kampaa. The thousand pillared mandapam stands opposite to it. This is also called Pallava gopuram. At the entrance to this gopuram, we see Vikatachakra Vinayaka. The customary way to enter the temple is to pay obeisance to Vikatachakra Vinayaka, turn to the right after crossing the entrance to the gopuram. In front of the temple, there is the temple Thiru Kachimayaanam, praised by Saint Appar. Along the four sides of Ekambam, we have four temples: Kachimayaanam, Vaalisham, Rushabhesham, and Satyanatesham. On the other side, we have Sivaganga, the sacred pond. It is large and is flanked by big trees. The dwaja sthambam (temple flagstaff) is quite tall. At the entrance, we would be greeted by dwaara paalakaas. Inside, we can also see the image of Karikaalachola to one side. Inside, we have Vaahana mandapam to the right and Pavitrotsava mandapam to the left from where the Mulaviraat can be seen. A little inside and to the left, we can see the image of the goddess. To the right, we come across the image of the Devi known as Pralaya kaala Sakti, as she is thought to protect the Temple City even at the time of the great deluge (Pralaya). The image of Sri Ekambareshwara, meant to be taken in procession, is located in the Sabha mandapam. At the sanctum sanctorum, we see the form of Somaskanda – a form that Rajasimhapallava had built and installed. Behind this image, we can see the images of Umamaheshwara, Chandrasekhara, Srikanta Sivacharya etc. During festivals and such special occasions, poojas and abhishekas are performed here. It is a sight to see Siva lingas all along the insides of the outer wall. The image of Panchmukha Vinayaka belongs to a much later period (1979). The sacred mango tree represents the vedas. As there are four vedas, so there are four branches to the tree. All the four branches bear fruit and it is said that the fruits of these four branches have four distinct tastes! According to the experts, the tree is more than 3600’years old. The childless believe that they will be blessed with, progeny if they tie a small swing to the tree. It is said that it was under this mango tree that the Lord appeared before the goddess. The mango tree can be circumambulated. Then there is a place known as Sahasralinga Sannidhi (a place where a hundred lingas are present). After a flight of steps, we come across the beautiful idol, Utsavamurti, of goddess Elavaarkuzhali. On the side, we have the idol of Lord Subrahmanya. There is a separate temple for this Lord known by the name Kumara kottam. Skandapuranam, the famous work giving the details of devotional stories and of miracles of Lord Subrahmanya, originated here. One can see the utsavamurtis of Lord Subrahmanya flanked on either side by his consorts Valli and Devayani. Behind these utsavamurtis, we can see the corresponding stone images. On the left, we can see the Nataraja sabha mandapam consecrated in 1961. Here, Lord Nataraja can be seen along with goddess Sivakami and the Saint Manikkavaachagar. Next to it, there is the idol of Bhairava. Opposite to the yaaga saala, we have the idols representing the Navagrahas (the nine heavenly bodies), with Surya (the Sun) at the centre and other idols facing the eight appropriate directions. To the left wehave the images of Nayanars – Thirukkurippu thondar, Iyadigazhkaatava bhupati, Chakya nayanar among others. Next to these, there is the Nalwar sannidhi, followed by the idols of the sixty- three nayanmars. Towards one end, we come across the idol of Santhanaacharya. In the front, one can see Svetakambar linga. In the next praakara, there are siva lingas arranged in a row, followed by Kallakambar linga, the idol of Chanseshwara, the utsavamurtis of the sixty three nayanmars, Nallakambar Siva linga, the idol of Surya, the place where Thirumangai Alwar received divine instructions, and the Nilaathunda perumal sannidhi. As the Lord manifests Prithvi linga, made of sand, water is not allowed to fall on it. Abhishekas are carried out only on the pana patham. Somaskanda’s image can also be seen. Worshipped by the goddess, this linga belongs to the class of Devika lingas. Every Monday, a shield is kept during the worship to commemorate the significance of the temple’s history. In the open, we have the dwaja sthambha and a large image of Nandi (the Bull) sculpted in stone. At some distance, there is a temple for Vaalisham. Along the banks of the sacred pond, there is this temple for Vrishabhesham. On the pillar in front of Kachiyamaanam, the images of Adi Sankara and Dakshinamurti can be seen. On two pillars in the Sabhanayakar mandapam, the images of Manmadha (cupid) and his consort Rati can be seen seated on the Chiluka (parrot) vaahana and Hamsa (swan) vaahana. Beyond the Navagrahas, going down the steps, we come across a pillar on which the scene depicting Lord Narasimha tearing open ahe demon Hiranyakaship placed on his thighs. On the pillar opposite to this, the sculpted image of Bhikshaatana can be seen. Pooja is conducted at eight times of the day, everyday. On radha saptami day, we can witness the Lord bathed by Sun’s rays. Beginning with Jeernodharana pooja on 25 October 1976, and concluding with Kumbha- abhishekam on 2 February 1979, the various poojas were performed by Jagadguru Sri Jayendra Saraswati, the head of Sri Kanchikamakoti mutt. Inscriptions were found in the temple belonging to the periods ruled by Rajarajacholadeva, Vijayakanta gopaladeva, Kampannaudayar, Achyuta udayar, Kulothunga I, and Kulothunga III. These inscriptions reveal a wealth of information regarding the injunctions, donations, and procedures for conducting the worship. In this temple, a fourteen-day grand festival takes place in the latter half of the month of phalguna. Thirunianjanam in the month of Jyeshta, Pooram in the month of Thai, Vaikunta ekadasi, the mondays occurring in the month of Karthika and Thiruvaadirai are among the significant festivals associated with this temple. This temple is on the northern border of the Chola kingdom and is part of the present day Tiruchi. Close to it, is the famous temple Srirangam. Praised as Jambukeshwara, the deity represents the element Water (of the five elements). The Jamun tree is the sacred tree under which the deity gives darshan. Rishi Shambhu is said to have been born as the white Jamun tree. The white elephant and the spider are said to be worshipped here. As Aany (elephant) is worshipped here, the name Aanikka came into usage. The deity is known by several names: Jambukeshwarar, Appulingeshwarar, Vennavaleesar, Jambunathar, Aanikka annal, and Nirthirazhnathar. Akhilandeshwari is the goddess. The sacred tree is the Jamun (known as ‘Jambu’) tree situated just outside the sanctum sanctorum. The sacred river is Cauvery. The temple has been praised by three nayanmars. The sanctum sanctorum has nine windows. The temple is big with high walls and tall gopuras. A distinct enclosure exists for goddess Akhilandeshwari. As the legend has it that the goddess worshipped the Lord, everyday around noon, a priest, dressed as the goddess, worships the Lord. This is one of the several temples consecrated with the Yantra, by Sri Adi Sankara, to worship Lord Siva. The temple comes under the aegis of Sri Kanchi Kamakoti mutt. The image of Vinayaka faces that of Akhilandeshwari. There is a legend that the Lord had two Sri Chakras made as ear-rings for Akhilandeshwari and adorned her with them. The fourth praakara (compound wall of the temple) is 32 ft high and 8000 ft long. This massive praakara s believed to have been built by the Lord Himself coming in the form of a Siddha by giving Vibhuti (sacred ash) as wages to the workers. A very famous temple and well-known all over India for the festival of Karthika deepam. The deity here is Annamalai swami and his consort is Unnamalai. Ramana Maharshi attained Sahaja Samadhi by the grace of Lord Siva and lived here for fifty years until the end. The Ramanashramam, developed around where Ramana Maharshi lived, attracts thousands of devotee’s everyday. The eastern gopuram of the temple is 217 ft high. It is one of the most prominent temples of TamilNadu. The southern gopuram is known as ‘Thirumanji’ gopuram, the western gopuram is known as ‘Pishacha’ gopuram, the northern gopuram is known as ‘Ammana amma’ gopuram. Here, the hill is considered the Lord’s form. Circumambulation of the hill is regarded as very sacred and attracts a large number of devotees. This is the place where the Lord, having mercy on King Vallala, was born as his son. The names Arunachaleswara and Annamalaiyar are associated with the deity. Unnamalai and Apithakuchamba are the names by which the goddess is known. The screw pine tree is the sacred tree associated with this temple and the Brahma tirtham is the sacred pond. The temple has been praised by Saint Sambandar and Appar. In front of the main temple, there is a spacious mandapam. The eastern gopuram is sixteen storeyed. On the gopuram, one can see sculpted figures in various dance postures. 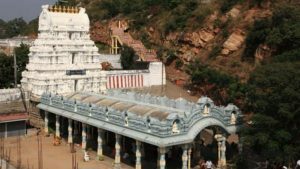 Devotees proceed to have the blessings of Sarvasiddhi Vinayaka on the banks of Sivaganga, pay obeisance to Sri Kalyanasundaramurti, pay their respects to Nandi, climb the steps, and go to the main deity. Next to the Vallala gopuram, the devotees will have the darshan of Lord Subrahmanya who is flanked by Valli and Devayani. Beyond and to the right of the gopuram, there is Saktivilasa sabha and Kalyana mandapam. To the left, there is Kalabhairava Sannidhi and in the front, there is Brahma tirtha. One comes across images of Vighneswara, Nareshwara, Vidyadhara, and Brahma linga. After a further flight of steps, passing the image of Bhairava and Sanishwara, we see to the right, the image of Ekambareshwara. Behind this, there are the Saptakanyakas (the feminine aspects of the seven deities), Ayyappa swami, Renukambal sannidhis. If we go by the mountain path, we come across the sannidhis of the goddess, of Chitragupta, Sambandar. Further on, we see inscriptions. The stone image of the goddess is relatively small in size. Straight across, we come to dwarapalakas, pay respects to Palani Shanmukha, pass the metal-plated dwajasthamba, enter the sanctum sanctorum; we are face to face with the sacred deepam (flame). To the right, there is the utsavamurti mandapam. Circumambulating inside, we come across utsava murtis, Saptakanyas, Gautama, Durvasa, Somaskanda, Chandrasekhara, Venugopala swami, Gajalakshmi, Shanmukha, Bhikshatana, utsavamurtis of the sixty- three nayanmars, and the Nataraja sabha sannidhis. We also see the Siva lingas worshipped by Viswamitra, Patanjali, Vyagarapada, and Agastya. Soon after entering the temple, to the right of the idol of Sarvasiddhi Vinayaka, we see the Paatala lingeshwara sannidhi, and the place where Ramana Maharshi was in deep meditation. Notable festivals include Karthika deepam, Adipooram, Uttaraayana, Dakshinaayana punya kaalam, Chitrotsavam, Kandashashti, Andal utsavam, Panguni uutaram. Besides these, festivals are conducted every month. Spread over 25 acres, with seven praakaras, the temple is praised in Thiruvaachakam and Thiruvenbaavai. Worship conducted at eight times of the day, everyday. As Koshtamurtis, images of Vinayaka, Dakshinamurti, the significant lingodbhava, Brahma, Durga can be seen. This is located on the northern part of Cholamandalam. The city is known as Tillai. The temple is called Chidambaram. Owing to the popularity of the temple name, the city is referred to the same name. ‘Che deity is the famous Nataraja swami. The temple has several names: Perumpatrapuliyur (due to the dedicated worship offered by Vyaaghrapaada), Chit + Ambaram (Jnana + Space) = Chidambaram, Bhuloka kailash, Pundarikapuram etc. The resident devotees, known as Dikshitars, are the officiating priests. The temple represents Akasha (Sky; of the five elements). Among the five sabhas, this is Kanakasabha. The deity is referred to as Chidambara swami, Ambala koothar, Thiruchitrambala udayar, Ambala vaanar, Koothabiran, Kanaka sabaapati, and Sabhanaayaka. The goddess is Sivakami or Sivakama sundari. The banyan tree is the sacred tree. There are several sacred ponds associated with this temple – Sivaganga, Brahmananda koopam, Vyaghrapaada tirtham, Brahma tirtham, and Ananda tirtham. There are five sabhas (halls) in this temple: Thiruchitrambalam, Ponnambalam, Perambalam, Nritya sabha, and Raja sabha. • Chitrambalam: Saint Appar referred to this sabha as Chitrambalam. This is the sabha where Nataraja danced. A superior quality copper plating can be seen. Inscriptions indicate that Paraanthaka Chola gifted Gold. The legends associated with the temple mention that Hiranyavarman had donated Gold. The sabha is situated on a raised platform. To go up, we have to climb five steps representing the Panchaakshara. • Ponnambalam: The sabha where abhishekam was performed for Natarajaswami.lt forms the frontal part of Thiruchitrambalam. Here the linga, made of alum, is worshipped six times in the day. In the second half of dawn, abhishekam is performed on Ratnasabhaapati. According to the legend of Sekkizhar Edankazhinayanar, Aditya Chola I brought superior quality Gold from Kongunad to cover the front portion of this sabha. The song ‘Kadivettu pattu’ says that Manavil koothan, the King of Kalinga, donated Gold to Ponnambalam. • Perambalam: This is devasabha. It is said, based on a temple song, that Manavil kootham, King of Kalinga, had arranged to cover the sabha with Tamrapatra during the time of Vikramachola. Later, Kulothungachola III covered it with a Gold. The hundred-pillared mandapam, Nandavana (garden) was constructed by him. It is said that he donated thousand cows. He had Thirumurai engraved on copper plates. Nrityasabha: This is situated to the south of the dwaja sthamba of Natarajaswami. This is the sabha where the Lord performed ‘Urthwa tandavam’. The image of this dance posture can be seen here. Rajasabha: This is a thousand-pillared mandapam. The kings of the Chola dynasty were sworn in here amidst the people of Chidambaram. The Jeernodharana pooja for this sabha was performed by Vikramachola. After the Chola rule, this sabha came under the people of Chidambaram. The commander of Vikramachola, Ponnabalam kootham by name, constructed the thousand-pillared mandapam in the name Vikramachola. A mandapam to study 1 Thevaram was built by him. He had the text engraved on copper plate; Jnana Sambandar had this Sabha with Gold-plated. The eastern gopuram is seven storeyed. Inside, on four pillars, beautiful sculpted figures in various dance postures can be seen. On entering, to the right is the thousand- pillared mandapam. We can see all the songs of Thiruvaachakam engraved on stone. On the western bank, there is the sannidhi of Pandinayaka (another name of Shanmukha). The sannidhi of Sivakama Sundari is separately situated. On the inner praakara, the sannidhis of Sahanayaka, Urthwatandava, and Sarabhamurti can be seen. In the sannidhi of Natarajaswami, the gold-plated dwaja sthambham is present. The sannidhi of the goddess is within the praakara. Next, the idols of Kambathillaiyanar, Thaayumanavar, ■ Vinayaka, Subrahmanya swami can be seen. Adjacent to the Swami sannidhi, the gold-plated idol of Parvatidevi can be seen. Here we find the mandapam of Sani. There is also the Alzhagar sabha. Ambala koothan is in the smaller sabha of Chitrambalam. In the front, there is the Perambalam mandapam. Next to Nataraja swami there is the Chidambara rahasyam (representing the space within). Bats can be seen hanging in this cellar. On the left, we find Govindarajaswami sannidhi where the Swami is in the reclining posture. During circum- ambulation, we come across Venugopala sannidhi, the utsavamurtis of Yatirajar, Yoganarasimha, Koorathazhlwar, and Anjaneya. The abhishekam in the month of Aani, Thiruvaadurai in the month of Margazhi are grand festivals of this temple.